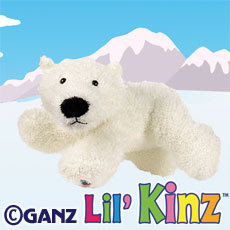 There is a lil kinz polar bear sale going on. This little one is new to the webkinz team. The cold weather is what this little bear loves. The snow and ice too. This bear would give this all up in a minute for a cozy bed, a warm room and a friend. This bear is also looking forward to play time a webkinz world. Special item is an artic window. Special food is frozen iceberg chili. Yummy and what a treat.